During my years of service to the Lord, I have had many glorious connections and divine appointments. My association with a missionary by the name of Dr. Mark Buntain took me to the land of India, where my heart was picked for the nations of the world. Through Dr. Syvelle Phillips, a long-life friend, I was led to be involved with Bible Directors. 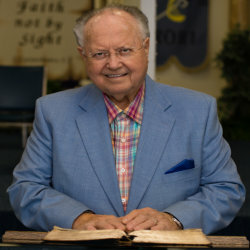 God has blessed me to minister with Dr. Jerry Savelle and serve on his ministry and missionary board for over 36 years as well as travel to Tanzania, Kenya and many other countries. I have been blessed to serve on missions boards, establish churches, travel to remote villages, finance the digging of water wells and feed the hungry children. Mentoring and teaching pastors of other lands has been a great joy. I have found myself preaching in India,Ireland, Russia, Kenya, Peru, Tanzania, Guatemala, Australia, Philippines and other countries in Central America and the Pacific Rim. Having seen the lame walk and the blind see. Have seen the joy on the faces of men and women who received the Bible in their own native tongue, having seen a village receive running water for the first time thrust me into the next phase of ministry. The urgency in my heart to finish the race, to go through open doors to the world is why I am writing you. You too can be a part of these harvest fields. I ask you to partner with me in taking the Gospel of Christ to the world an fulfill the great commission. If you would like to have a brochure, just drop us a e-mail requesting one. We will be glad to send you one. I agree with you that as you partner with me in these last days, that every need you have will be met. God says in Jeremiah 29:11,”For I know the thoughts that I think toward you, says the Lord, thoughts of peace and not evil, to give you a future and a hope.